Blue Science in San Antonio is a top rated pool builder that loves creating wonderful home pool environments. We want to design a pool for your family that works best for your specific needs and desires. A typical new construction project includes the inground pool, attached spa, pool deck and patio cover. We do it all. With more than 25 years in the Texas swimming pool industry, our San Antonio team of architects, designers, and consultants will manage your pool project with the utmost attention to detail. We approach every pool design project with an outlook that your new pool should complement the architecture of your home, blend with the backyard environment, and serve the particular needs of your family. We have construction consultants to walk you through designing the pool of your dreams. 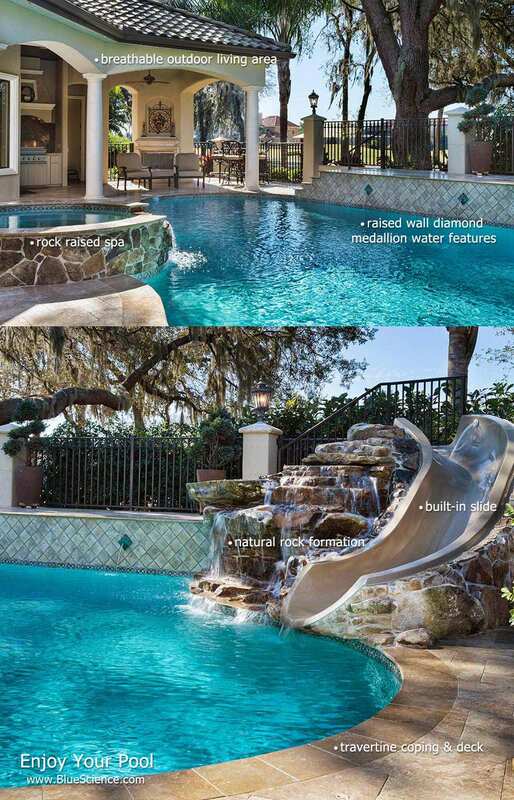 Charming traditional pool with built-in slide, natural rock structures, and raised wall water features. Beautiful lagoon style pool design with pebble plaster and stacked rock structures. 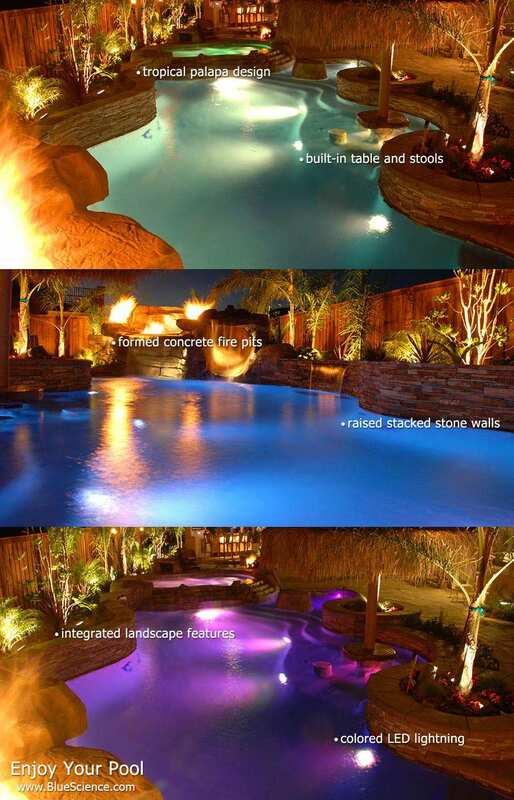 Alluring tropical style pool with colored underwater LED lighting, raised stacked stone walls, and built-in table & seating. 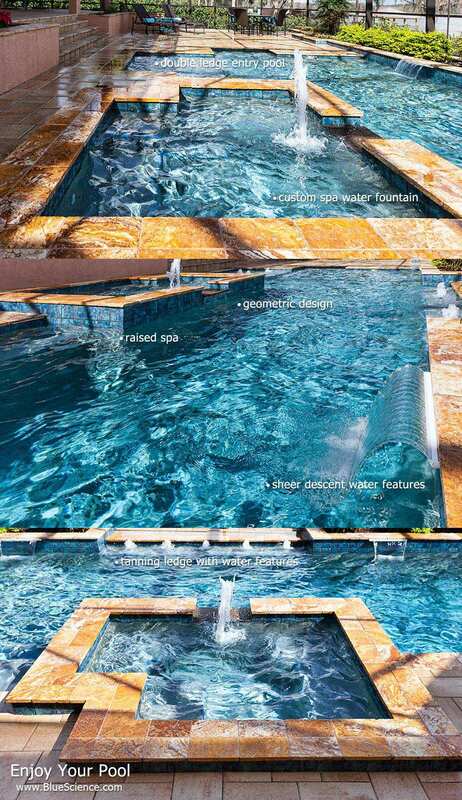 Custom geometric pool design with raised spa and water fountains. The warm San Antonio climate provides so many joyful days to sit out by your swimming pool. A beautiful deck that you enjoy can make all the difference. For some people, the most relaxing area of their backyard is not in the pool water, but the seating around it. The assortment of deck and surface options available for San Antonio homes is extensive. Common choices include travertine, decorative colored concrete, stamped concrete, custom stonework, and pavers. 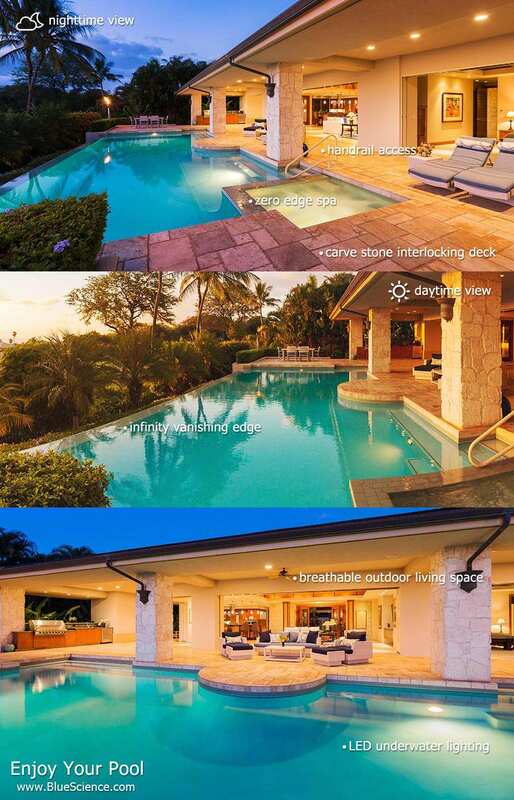 Choosing types, colors, and textures is a factor in a holistic pool design blueprint. For some members of the family, the most enjoyable area of the swimming pool is the surrounding deck and patio. The variety of deck surface options available in Texas is virtually endless - poured concrete, decorative concrete, stamped/colored concrete, custom stonework, brick, pavers, travertine, and more. Choosing which type, color, and material is an important part of the design process. It should complement your home's existing design and natural environment. San Antonio is the seventh most populous city in the United States and the second most populous in Texas with about 1,359,800 residents which cover approximately 412.1 sq. miles. San Antonio provides many great attractions like the River Walk, SeaWorld, and the historic Alamo, but there are many other great attractions like the numerous conventional Hispanic restaurants, air force museum, and San Antonio Spurs professional basketball team. 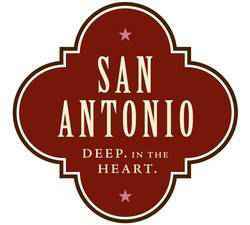 San Antonio was added as a base city for our company in January 2013 and with the friendly nature of the people of the city our company has grown to admire the city.